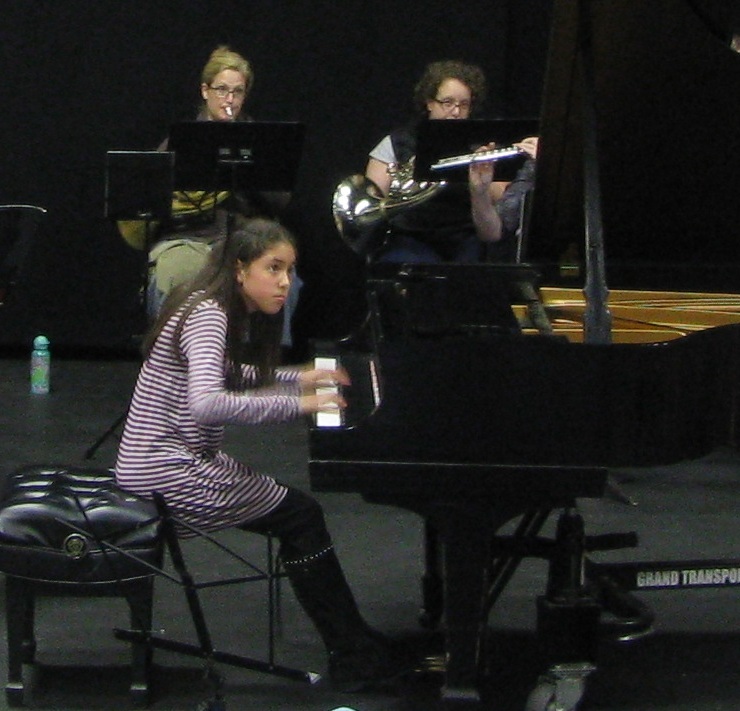 Brittany Alexa Rodriguez is a warm and personable 11-year-old—and a very remarkable pianist. Local audiences will have a unique opportunity to hear her play Mozart’s Piano Concerto No. 23 this weekend with the Falmouth Chamber Players Orchestra, under the direction of John Yankee. It should be a splendid concert for both children and adults. The Falmouth Chamber Players Orchestra performs Saturday, November 19, at 7:30 PM, and Sunday, November 20, at 3 PM, at Falmouth Academy, 7 Highfield Drive in Falmouth. In addition to Mozart’s Piano Concerto No. 23, the orchestra will play Handel’s “Music for the Royal Fireworks” and Beethoven’s Symphony No. 5. Suggested donation is $12 for adults and $5 for children 18 and under. 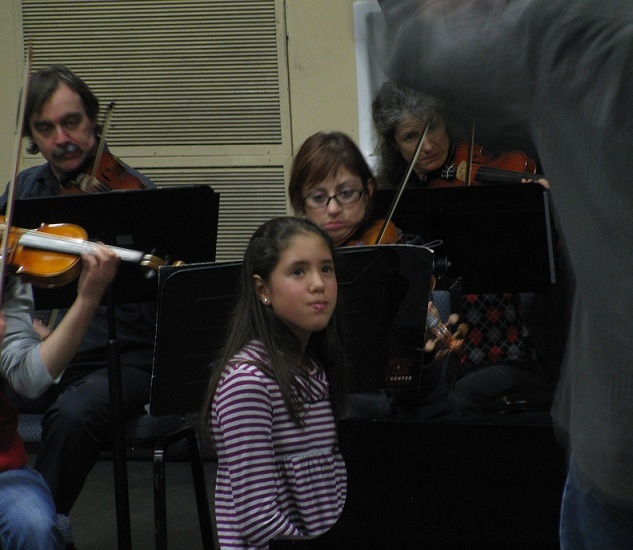 At her first rehearsal with the orchestra Thursday night, she played beautifully and confidently, and enjoying the interplay of the piano with the orchestra, which she told me was the best orchestra she had ever played with. John Yankee was clearly equally delighted with her, as were members of the orchestra. He did have to ask her to slow down her performance of the very fast final movement so that the orchestra could keep up. “Could you do it just a little slower,” he asked, “but just as thrilling and exciting?” And she did. 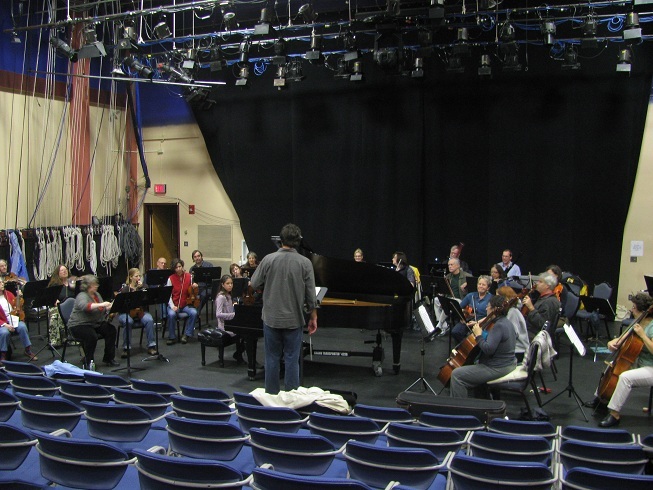 The concerto was originally scheduled to be performed by Robert Wyatt, an accomplished pianist and prominent member of the local arts community. However, Dr. Wyatt suffered serious injuries in a bicycling accident earlier this week. He is currently recovering in the hospital and is expected to be just fine, a relief to his many friends and admirers. John Yankee was not only concerned about his friend, but about the upcoming concert. He sent out an all points bulletin to his colleagues, other musicians, conductors, and music schools in search of a replacement. Within a day or two he heard back from Tom Novak, dean of New England Conservatory, who told him about Brittany, who has been preparing the Mozart concerto for a concerto competition at NEC and for a performance in Bogota, Colombia in December. Rehearsal begins at Falmouth Academy. Brittany started piano lessons at Westminster Conservatory in Princeton, NJ, the age of 5, after her parents, Marcos and Iris, noticed her fascination with a toy piano. By 6, she was performing in public. 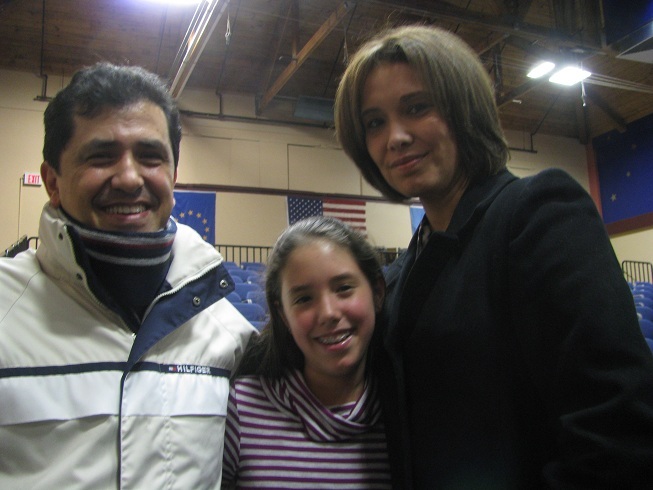 When she was 7, the family moved to Colombia, where her father was born. There, she continued her studies at the Unimusica Foundation in Bogota and taking private piano lessons with Sergei Sitchkov and theory with Elena Krasutskaya. In Colombia, she won the Jovenes Interpretes 2009 at the Biblioteca Luis Angel Arango, one of the most prestigious music competitions in that country. At the age of 9, she was the only non-college music student allowed to participate in the La Sala Fabio Lozano competition at Jorge Tadeo Lozano University, and was selected to be part of the 2009 concert series. 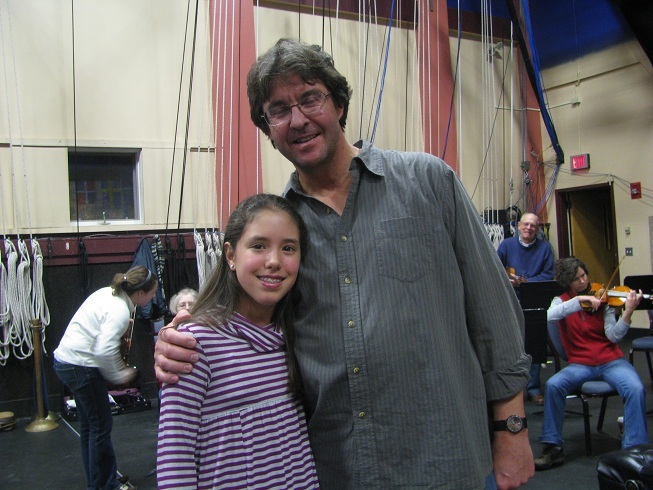 When Brittany was 9, and again when she was 10, she attended the summer music program at New England Conservatory. She received so much help there from Ms. Byun, whom her father describes as one of the best teachers in the world, that her family decided to move back to the US last fall so that Brittany could attend NEC’s Preparatory Program year-round. Bilingual, Brittany holds dual citizenship. Brittany is very talented, her father told me, but her abilities are not just the result of talent. She is also a very dedicated student and loves the piano. She not only takes piano lessons at NEC, but also takes theory classes at the Berklee College of Music, and attends a private school in Framingham for her “regular classes.” She is in the seventh grade. Brittany’s studies also require a big commitment from her parents, who not only moved back to the US to give their daughter access to a first-class education, they take her to lessons and classes, rehearsals and concerts, making sure she has everything she needs. It can be very time-time consuming, they said. And they try to keep her grounded so that she will have a normal childhood. They don’t push her, but allow her to progress at her own rate. The warmth and love between family members is very evident. Marcos plays guitar and studied music himself in Colombia, though he says he is not really a musician. All of Brittany’s weekly hour-and-a-half music lessons are videotaped so that she can study them during the week. Without the recording, said her father, it is easy for a child to forget the many comments a teacher can make during a lesson. He studies the videos along with her and helps her focus. Though Brittany likes the Mozart concerto very much, it is a big undertaking he said, a very difficult piece. It has three movements, each very different from each other, is 30 minutes long, and it must all be played from memory. It has to be very polished, said Marcos. “Mozart doesn’t allow you to make any mistakes because the music is so exposed.” You can hide a few mistakes in Beethoven,” he said, but not in Mozart. But it is more than that, he said. The second movement of the concerto, the very beautiful slow movement for which this concerto is so well known, is “deceivingly difficult.” There is a lot of “conversation with the orchestra” and many little details that Brittany will have to attend to. In the end, though, the piano brings joy to both Brittany and her parents, and all three are excited about this weekend’s concerts. Not only is it fun for her to play with the orchestra, but the experience should help her in the concerto competition (which will be performed with a second pianist playing an orchestra reduction) and in her performance next month with the Orquesta Filarmónica de Bogatà. Brittany turns 12 on December 16. For more information and to see videos of her performances, visit www.brittanyrodriguez.com. 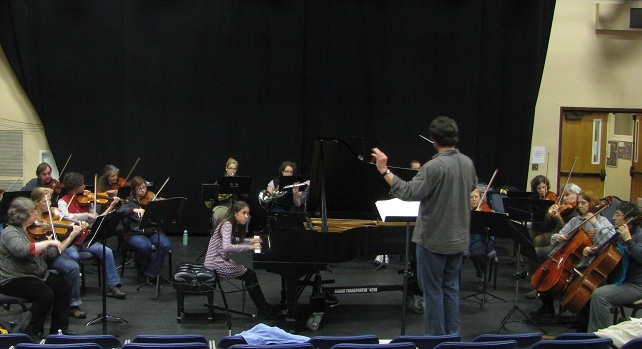 For more information on the Falmouth Chamber Players Orchestra, visit www.falmouthchamberplayers.org.